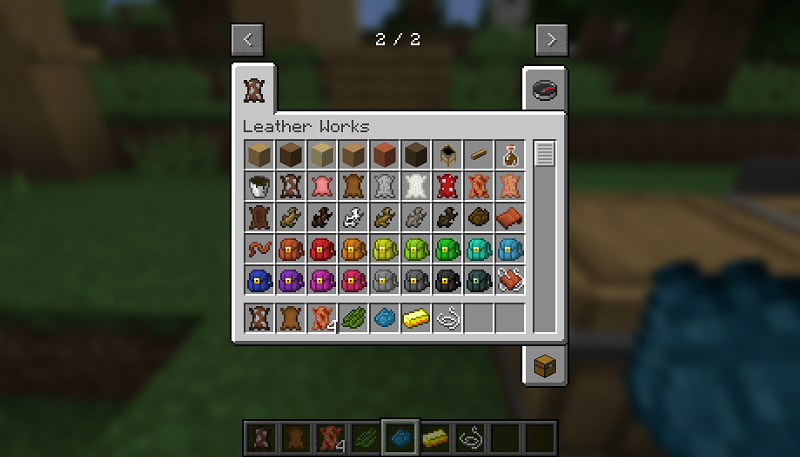 Leather Works Mod 1.12.2 aims to turn the leather into a more interesting object for players, mainly by adding the leather to the process of making new interesting objects, including backpacks, decorative barrels and a leather armor that can be repaired, among other things. First you’re going to need some hides. Go kill an animal with your murder weapon of choice. After you have some hides, the next thing you’re going to need is flint. Craft flint with the raw hide to get prepared hides. Next you’re going to need some tannins. Tannins are currently found in tree bark. Shift hold right click on a log with flint to scrape some bark off. This has a random chance per tick. 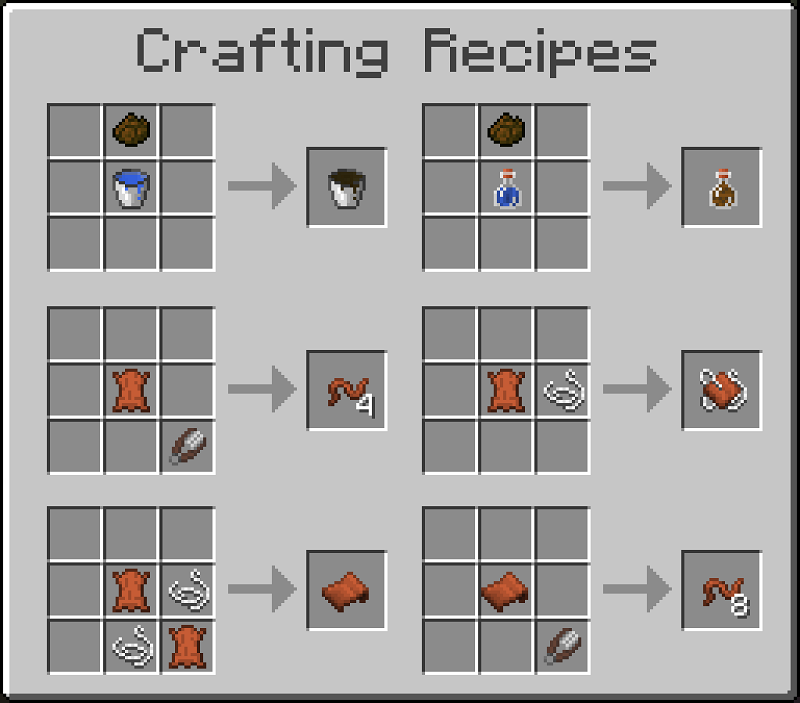 Now shapeless craft bark of the same type to get a ball of tannins. 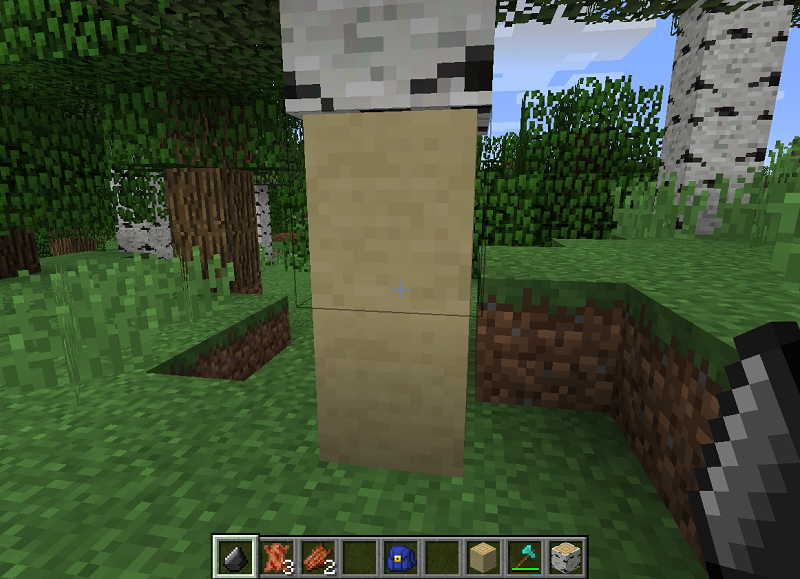 Different trees will require different amounts of bark. Now you need to clean the prepared hides in water. This can be done in the world or in a barrel or cauldron. 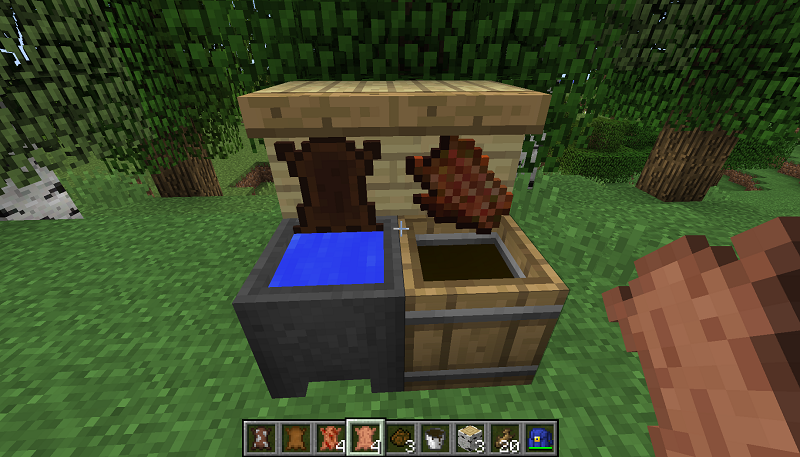 Barrels are very similar to cauldrons but made in a U shape of planks. They will have more uses in other mods in the series. Once you have washed your hides you will need to soak them in a tannin solution to preserve and darken them. Right click a barrel of water with a ball of tannins and use the washed hides on it. Note you will get 3 uses per bucket. 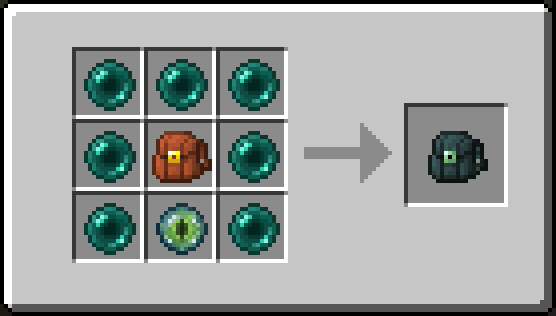 For mods or packs that restrict iron to mid game, barrels will quickly fill up with rain water and can be added to or drawn from with glass bottles as well. Craft a Drying rack (3 wood slabs in a line) and dry your soaked hides. After a bit of time you will get leather…unless it rots! Most people don’t use leather armor because the tech jump to iron is usually a matter of minutes. When your armor would normally break, it will instead become tattered leather armor. When it does this, if you have enchantments, they will be carried over but there’s a chance they could reduce a level or disappear if it’s a level 1 enchant. Tattered leather armor provides no protection. To repair your armor, all you need to do is craft a leather repair kit, (1 string, 1 leather) with the tattered armor and it will repair some durability. This works with dyed and named armor as well. 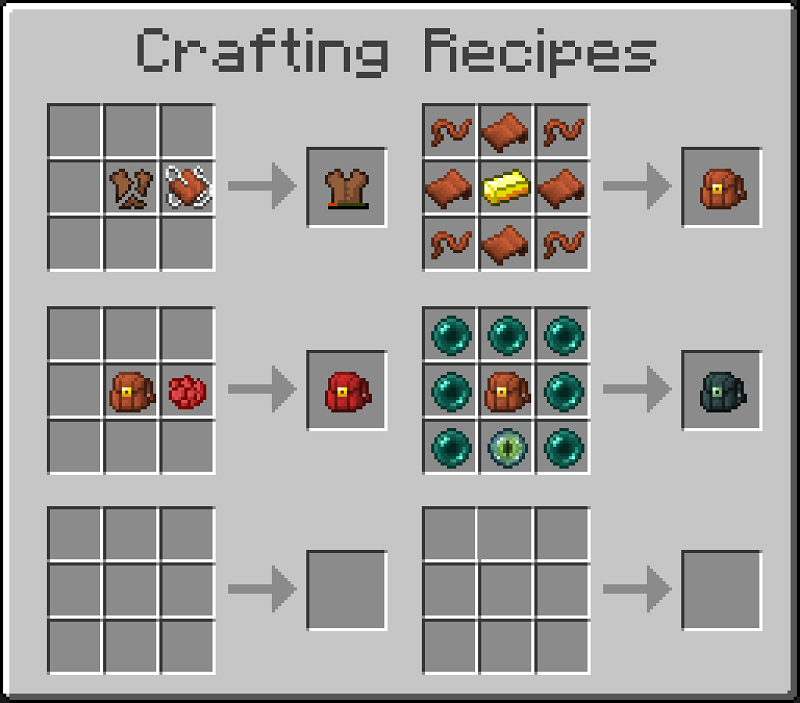 Intermediate items for modpack makers as well as internal use. Leather Sheets: An alternating 2×2 of leather and string will create a leather sheet. This is for use in some larger leather recipes. Leather Strips: (craft leather or leather sheet and shears) Leather strips are used to bind items together. You know what a pack does. 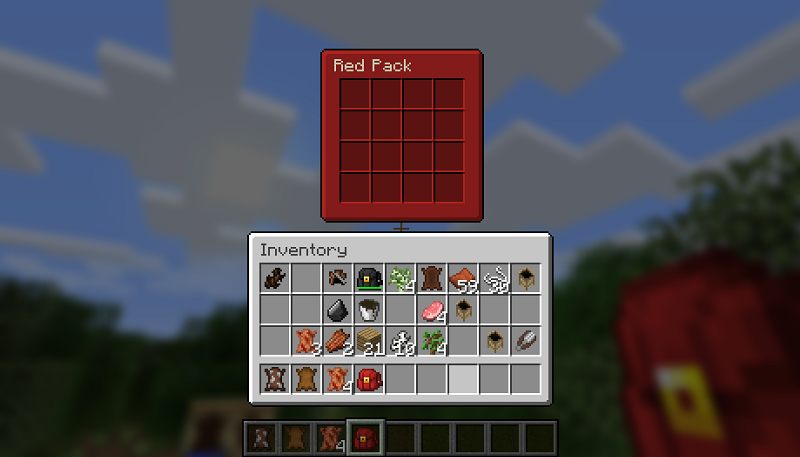 These packs are smaller than some other mods and cost more. They’re meant to be simple and with no frills. 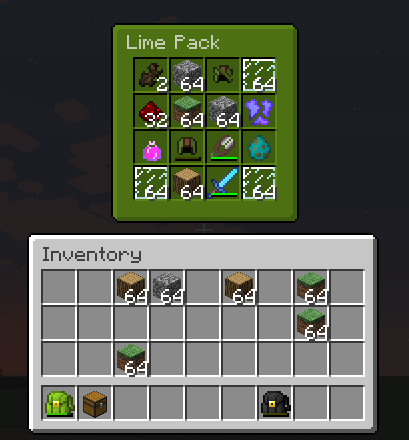 Packs can be colored and named and will eventually support pulling from and dumping into containers. 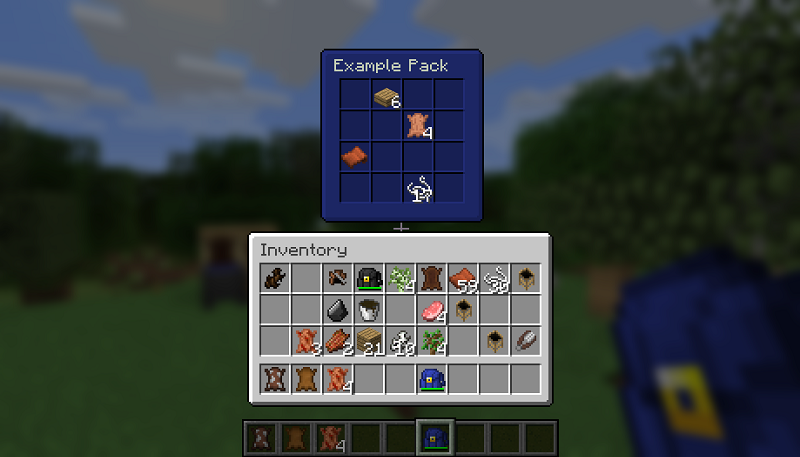 Packs can also be dyed and undyed with a barrel of water or a cauldron. For the builders out there, using a wooden pressure plate on a barrel will create a sealed barrel. These are rotatable and are meant for decoration. 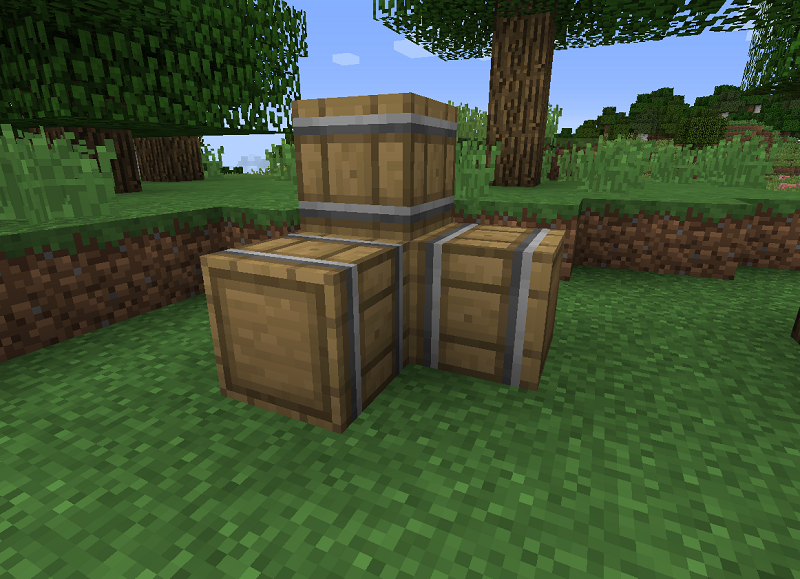 You can also craft a wooden pressure plate with a barrel or use it in the barrel recipe. (Again, recipe pics in the Images section. Barrels will take all fillWithRain() ticks to increment water level. 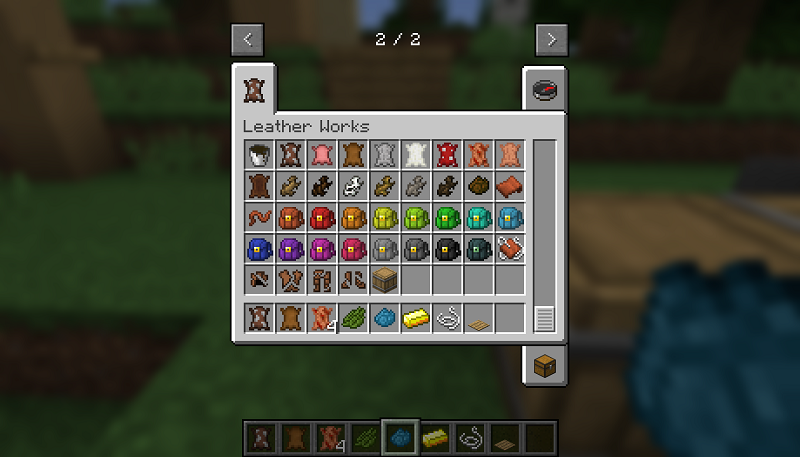 You can wash leather armor, worn leather armor, and packs in a water barrel. Polar bears and pigs drop 0-2 hide without fortune. Wolves drop 0-1. 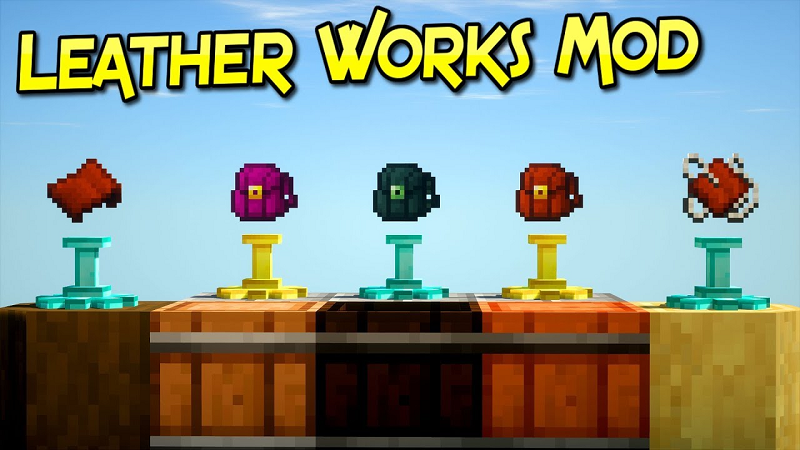 Leather Works replaces all leather drops from the entities it supports, so mods that increase leather drop rates will increase hide drop rates. 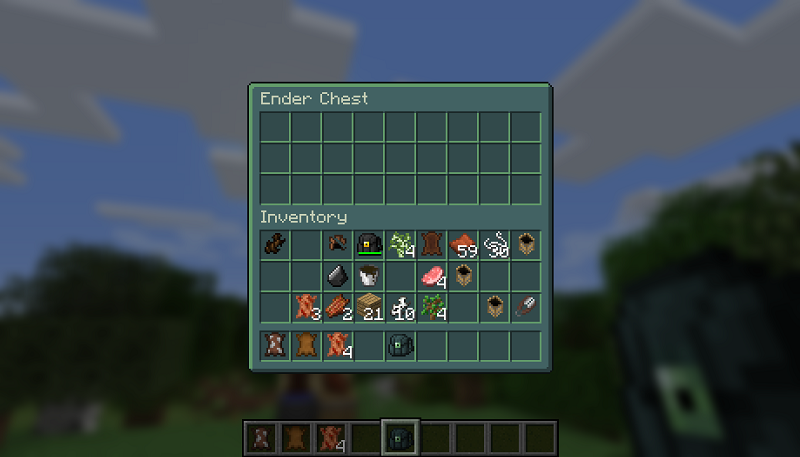 When leather armor wears, it has has a 1/3 chance of reducing enchantments by 1 level, on each enchantment. Level 1 enchants are removed at the same chance. 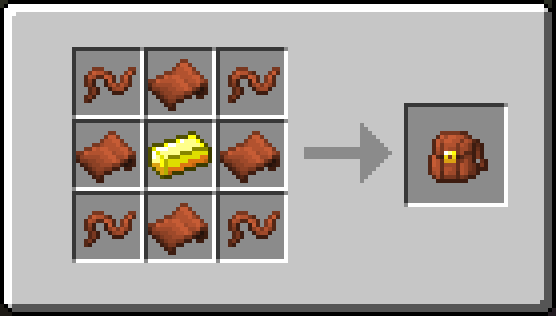 Drying leather has a 5% chance of failing and returning rotten flesh. 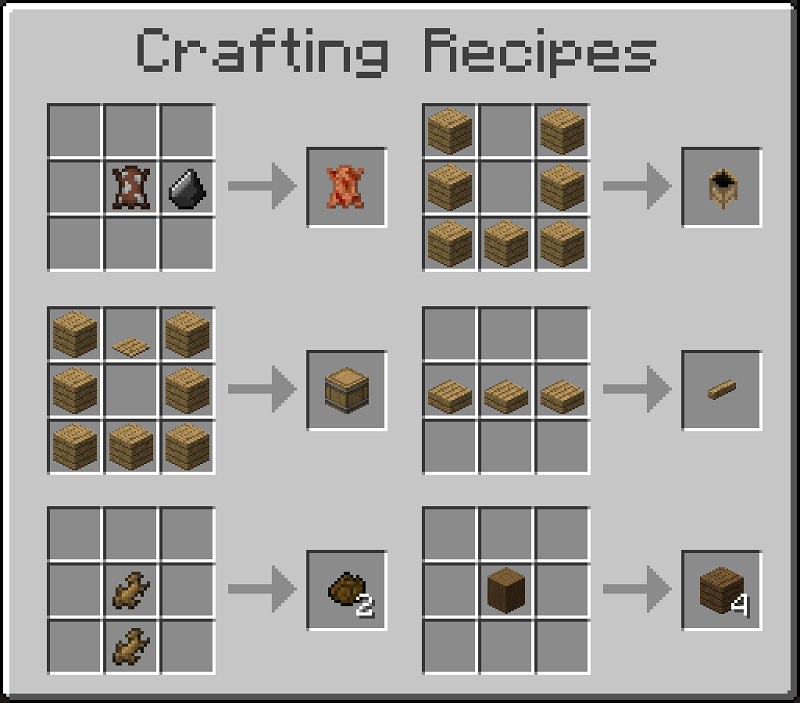 2 Oak or Spruce bark makes 2 tannin balls, 1 Acacia or Dark oak makes 2, 4 birch or 3 Jungle bark make 2 as well.